Kiwi.com, one of the world’s leading online travel agencies, said today that it has won the “Online Tool” category in the 16th annual WebTop100 digital marketing competition. This follows the announcement in October that Kiwi.com had topped the Deloitte Technology Fast 50 Central Europe ranking after becoming the fastest growing technology company in Central Europe in 2017. Each year WebTop100 assesses the quality and professionality of the websites and marketing projects of Czech companies. In total, 222 projects applied for the 16th edition of this competition and were assessed by 60 experts from various fields of digital marketing. For this year’s competition, two new categories, “Online Tools” and “Self-Care”, were added to give a total of ten categories. The jury was focused on the purpose and benefits of the online tool, who will use it, and in what situations. The following criteria were taken into account during the overall assessment: design (weighting 20%) – attractiveness, modernity of design and efficiency of the tool’s goals; functionality (weighting 20%) – technical functioning of the tool and the range of functions with regards to the purpose and goal of the tool; usability (weighting 30%) – intuitive operation and clarity of the tool structure; content (weighting 20%) – relevance and clarity of content; safety (weighting 10%) – addressing potential security threats for users (unaware erroneous decisions, sensitive data leakage, etc). Judged on these criteria, the expert jury found Kiwi.com to be the best in its class. “We strive to continually develop our product and enrich it with more customer focused features. Our goal is to provide customers with a comprehensive tool for vacation and journey planning, and we are delighted that the expert jury appreciated the quality, scope and complexity of the Kiwi.com offering,” said Oliver Dlouhý, founder and CEO of Kiwi.com. 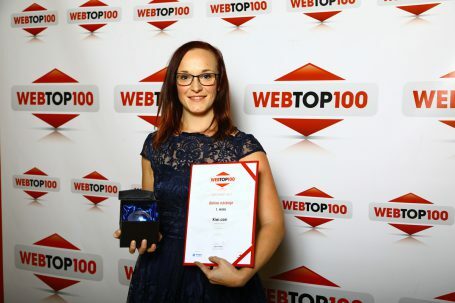 The website of Kiwi.com, an online travel agency engine and airline ticket vendor, won the first place in the competition with an overall rating of 81% and was included in the WebTop100 best digital solutions catalogue of 2017.